It always came as a surprise to me when I would be talking with tourists as a concierge in say, June, and they had no idea that had they come in winter, they could have seen whales. Two Maui vessels last week reported seeing the mammals, the first two credible sightings this season. Humpback whale season generally runs from November through May. As many as 12,000 whales winter each year in the waters off Hawaii. Endangered humpback whales are protected in Hawaii. On another note there was another shark attack on a visitor at Makena on Saturday afternoon. A 51-year-old woman from California was approximately 20 yards offshore when she was attacked by a shark estimated to be between 10 and 12 feet long. The Maui News reported that the woman suffered “non-life-threatening injuries, including puncture wounds to her right inner thigh and lacerations to the front and back of her right hand from pushing the shark away,” according to Fire Services Chief Lee Mainaga. The woman was transported to Maui Memorial Medical Center in stable condition. Ocean safety crews closed the beach. I was plenty naïve when I moved to Hawaii. Seeeing a fire truck go by with surfboards strapped to the side, I remember thinking to myself, wow, when the waves get big, they just pull over and go surfing? (That’s what everybody else does!) Noooo. Those surfboards are for rescuing people. I’ve come a long way. To wit: The body of a 35-year-old male diver was pulled from waters near Maalaea Saturday and pronounced dead at the scene. He was reported missing at 4 AM having last been seen around 3 AM, according to Lee Mainaga. (What was someone doing diving is that time of the morning? )He was spotted by a commercial ocean craft floating facedown a half-mile from the Beach park, then taken to the Maalaea boat ramp where he was pronounced dead by medics. All of this plus a tsunami watch. It’s been a tense few days on Maui, but nothing like they are experiencing on the East Coast. For those in safe, dry areas…Happy Halloween! Lahaina will be celebrating like crazy downtown in what they call the Mardi Gras of the Pacific. It gets absolutely nuts with the scanty costumes and copious alcohol. In true Hawaiian fashion, nothing is without its drama. A Hawaiian activist went to court to try to get the celebration stopped… He said it would interfere with Hawaiian historical areas. It was thrown out of court. To all of my readers on the East Coast, I send out a heartfelt wish for your safety and a swift return to normalcy. I hope you are not without power. Be safe! To those who have opened up a discussion about the tsunami warning in Hawaii, I offer the following thoughts. One reader, TC, happened to be on Maui during the tsunami warning and asked if the level of panic observed is normal here. When you live on Maui for a while, the enormity of being a spec in the middle of the ocean grows. It feels a bit like being a flea on an elephant. We are the farthest from any landmass of any Archipelago. (Not just Hawaii, but Maui.) For those who have lived through dock strikes, or a hurricane, or a tsunami, it becomes readily apparent how dependent we are on the outside world for absolutely everything, from toilet paper to rice, to bottled water. A fire alone can shut down the whole west part of the island. I’ve seen it happen. There is no getting in or out, because there is only one road in, and they now close down the northern route so it will not become clogged with people and cut off emergency vehicle access. More than once I had to get a hotel room and sleep on the west side when I couldn’t get home from work, due to a disaster. People are very attuned to this when authorities say a tsunami is coming. They immediately picture no electricity, no food, no ships getting in with supplies for God knows how long. The thing about a tsunami is that there is essentially no warning. An hour or two maybe, and then it’s a call to evacuate. Tsunamis travel at 500 mph plus-the same speed as a jet. There is little response time, no planning ahead. Mike was a fireman on Oahu for 12 years and amazingly, spent less time fighting fires than he he did rescuing people from the ocean, and on occasion, from big waves washing over people’s houses. That’s just what the North Shore is like in the winter time. He says the level of panic of people fleeing during a tsunami warning also has to do with responsibility. Responsible people realize that if they don’t act, they are jeopardizing the life of someone else (such as Mike) who must then come in and rescue them. One disconcerting fact that came out during the news reports on television for this tsunami warning: there are no buoys between Hawaii and the mainland. None. So when the earthquake struck Canada and reverberated out, they had nothing to look at to check the rising tide between us and them. So we had to prepare for the worst. 1. How fast do tsunamis travel? Tsunami wave speed is controlled by water depth. Where the ocean is over 6,000 meters (3.7 miles) deep, unnoticed tsunami waves can travel at the speed of a commercial jet plane, over 800 km per hour (500 miles per hour). Tsunamis travel much slower in shallower coastal waters where their wave heights begin to increase dramatically. 2. What does a tsunami look like when it reaches the shore? As the leading edge of a tsunami wave approaches shore, it slows dramatically due to the shallower water. However, the trailing p art of the wave can still be moving rapidly in the deeper water. This results in a “piling up” of the tsunami energy, and the tsunami wave height grows. The wave looks and acts like giant river of water on top of the ocean that floods the shore. 3. Where and how often do tsunamis usually occur? Major tsunamis occur about once per decade. Based on historical data, about 59% of the world’s tsunamis have occurred in the Pacific Ocean, 25% in the Mediterranean Sea, 12% in the Atlantic Ocean, and 4% in the Indian Ocean. Stay safe, and treasure each day. If you are a reader on the East Coast, please let me know you’re okay! So I’d already had my allotment of excitement for a Saturday night and was now reading, of all things, “Finding Your Way in a Wild New World” by Martha Beck, when the air-raid siren went off. That sucker is LOUD. And since it wasn’t noon on the first day of the month when the firemen do their test signal, it got my full attention. “What the…?” I personally think that Americans need to come up with more creative ways to curse at times like these. The British are quite good at this, but when an American utters, “Bloody hell” or “Bullocks,” we just sound like pompous asses. Anyway, I thought maybe someone set off the siren accidentally. After all, nothing was going on. Right? Wrong. Last night we had the tsunami that wasn’t. After a magnitude 7.7 earthquake struck off Canada, we were placed on tsunami warning, the highest alert…signaling that all coastal areas were likely to be hit by a wave and initiating evacuation efforts. About an hour later, Maui Civil Defense issued an “immediate evacuation advisory,”and Kahului was evacuated. We could see the lines of cars snaking up Haleakala Highway and Omapio Rd. from our back porch. Made me feel all fuzzy inside to live this far away from the beach for once. Panic because they were telling us the boats could have to stay out for days. We gathered up every gallon of water we had, and because I cook from scratch, there was essentially no canned food in the house to send with him. I felt like a failure: if the tsunami doesn’t get him, he’ll die of starvation. And there was no time to go to the store. The warning came late; this was all going on about 10:30 PM. Mike stayed out with the boat off Lanai that night, and all the next day. There was some minor damage of Maalaea harbor and Lahaina harbor. But all in all, it was the Hawaii tsunami that wasn’t. Fast-forward two years, and here we are again. We gather up the flashlights, check the batteries, make sure the weather radio is working. We take all the ice out of the freezer and put it in a cooler and replace more Tupperware containers full of water in the freezer. The scary thing is our main electrical transformer is in Kahului, way too close to the water for comfort. What were they thinking? So there’s always the chance we could lose power, and refrigeration, for days. After a tense three hours, Kahului has been evacuated, and… Nothing. Barely a ripple of higher waves on the shoreline. Kahului and Paia were both taken out by a tsunami in the 1950s. A woman I know tells the story of her grandmother hanging wash on the line in Paia with her children playing in the yard, and she heard the wave before she saw it. She dropped the clothespins, grabbed her babies and ran for higher ground. They were safe. This time it was reported that the warning sirens on the Big Island failed to go off in a number of places. 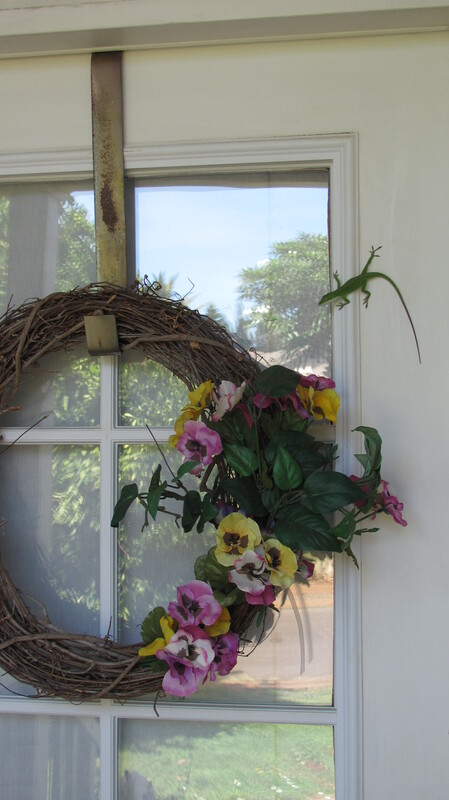 The news reporter on television laughed and said, “Probably a gecko crawled in there and died.” Yes, the geckos are troublemakers…. but it doesn’t inspire much confidence in the system. After Japan’s tsunami, we’re all aware of what could happen. There was pandemonium in crowded Waikiki last night with everyone in their cars, rushing to higher ground. Many car accidents. Eventually on the news, they told everyone to just get out of their cars, leave them where they were, and get to higher ground. The lines at the gas stations were jammed, which is why I make it a practice to always fill my car when it hits a half tank. It seems we’ve had many instances of a tsunami in Hawaii that wasn’t. I worry that it’s become a bit liking crying wolf, and one of these times people will simply refuse to evacuate. In the meantime, I enjoy living at an elevation of 1500 feet. Living at the beach sounds like fun…till it isn’t. This is always a good reminder that life can turn on a dime. Time is short, the people in our lives are precious. It doesn’t seem like there would be much change in seasons in Hawaii, and it’s very subtle, but it is there. Especially in Upcountry Maui. 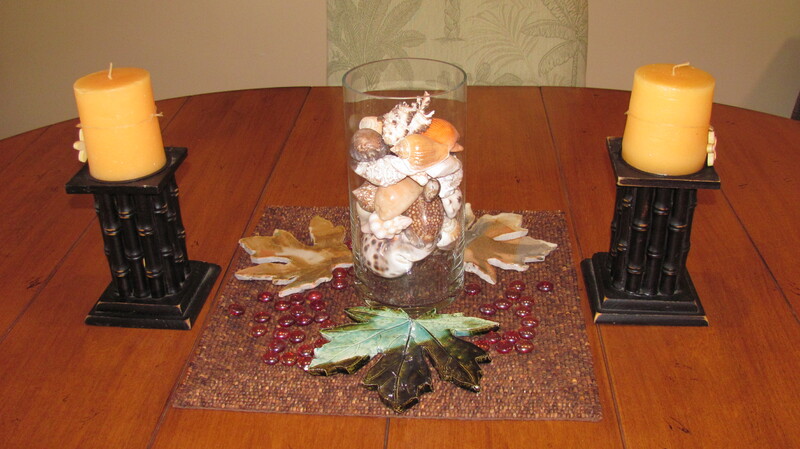 On the mainland I always enjoyed the change of seasons… Getting out all of the fall decorations, the Halloween decorations, the Thanksgiving decorations… And the places to buy them were of course, endless. 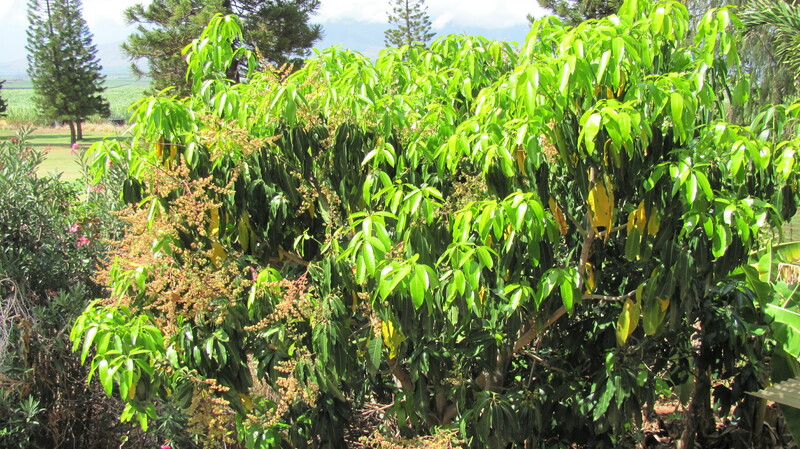 Our mango tree in the backyard also provides a clue that fall is here on Maui. If you look closely in this photo you’ll see that we have older yellow leaves dropping, healthy older dark green leaves, light green brand-new leaves coming in, and to top it all off: it’s flowering with new fruit (that’s the brown fuzzy-stuff). What this means is there’s never a good time to prune a tree in Hawaii. Our citrus tree in the front yard does the same thing. It’s a tree that’s been grafted with tangerines, tangelos, and oranges on the same tree. The tree has become enormous because there is constantly a cycle of new leaves and new fruit. 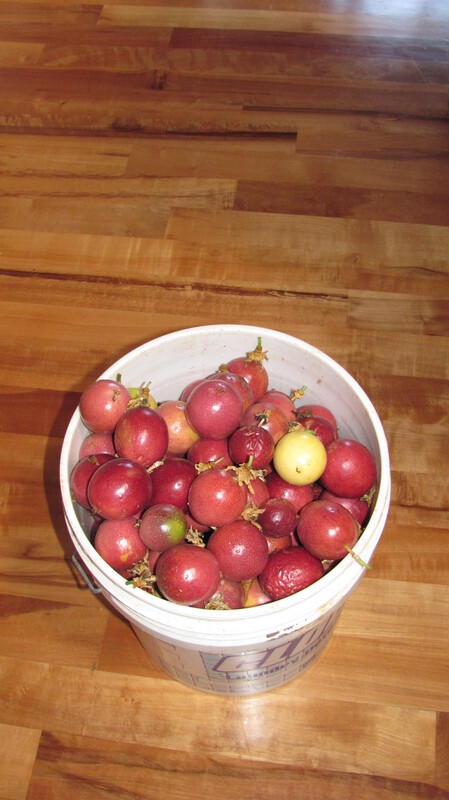 When the heck do you prune, without losing fruit? And why yes, that IS a surfboard hanging there in the rafters too. Thanks for asking. And that second refrigerator in the background is not a “beer frig”, because in Maui almost all dry goods have to be refrigerated or use lose them to bugs. So that frig has flour, sugar, bread crumbs, bread, cornmeal, etc. in it. If you don’t refrigerate your bread, it can mold in a day or two. It doesn’t help to call my friends and ask if they’d like some fruit, because they have the same problem. 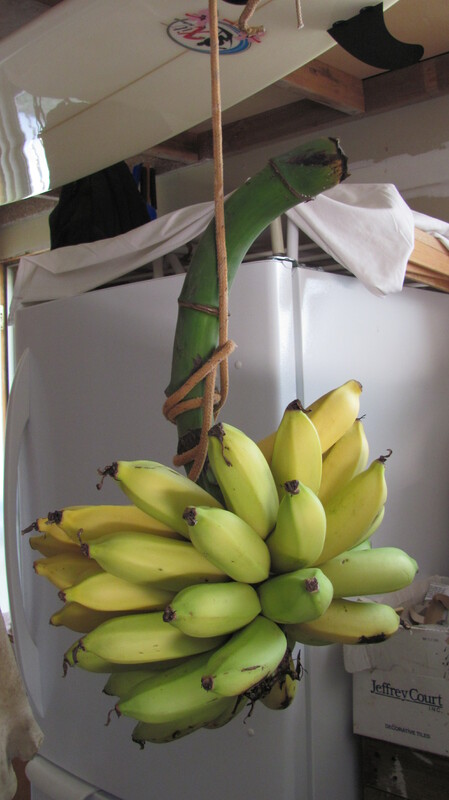 So I’ve taken to hauling fruit to Kahului when I go down the hill, and giving it away. Yesterday a doctor got eight apple bananas in a brown bag. He is a fierce Korean guy who pretty much scares me spitless. I gave him the bananas and he lit up. As he was leaving the room he said “This will be my lunch” and I teased him and said, “Hey, I know you have children!” and he just laughed, because those kids weren’t getting any of those bananas. That’s the first time I’ve heard him laugh! Food, the universal language. Here’s a recipe for Lilikoi Martinis. My thanks to Shel and Clay Simpson for turning us on to these intoxicating gems. Fill a glass with ice. Shake the above two ingredients together, add to glass, then top it off with ice-cold water. I get creative and substitute out recipes that involve lemon juice, such as a Lemontini or Lemon Drop. So, to the above recipe I will also add a little St. Germain (YUM) and substitute club soda or seltzer water for the plain water. Next time you get your hands on some lilikoi juice, enjoy a martini. You can possibly find the Perfect Puree of Napa Valley lilkoi puree in your gourmet grocer’s freezer section. And if anyone has figured out a fool-proof method for pruning the ever-flowering fruit trees in Hawaii, give a shout. Do you know what luau feet are? It’s the term used in Hawaii to describe flat feet caused from wearing rubber slippers (“rubbah slippahs” in pidgin, thongs or flip-flops on the mainland.) Mike has flat feet. Until he saw my feet with their impossibly high arch, he didn’t even know feet were supposed to have an arch. And the first time I heard someone local refer to slippahs, I was confused and thought they meant house shoes. Slippers. This gives you just a tiny peek into the confusion that reigns supreme in our household. Right now I am in mourning. I lost one of my best rubbah slippahs. And I had only worn them twice! I had been looking for this pair for about five years. “Reef” makes a certain type of very cushioned flip-flop with a soft fabric band between the toes. They became very hard to find… and I was even more specifically looking for BROWN ones. I finally found them in a tiny shop on the North Shore of Oahu. I was as excited as if someone had given me a diamond ring. Then the proprietor told me the bad news: Reef was discontinuing these! How could this be? They’re so comfortable. I read that podiatrists say if you’re going to wear rubber slippers, that it should be these cushioned Reefs. I could walk all day in them and my feet don’t hurt. Podiatrists are not fans of flip-flops. Besides leaving your feet vulnerable to injury from stepping on sharp objects or getting stepped on themselves, flip-flops offers little support, slip off easily while walking, and can actually affect your gait–making you vulnerable to potential heel, arch, and back pain, plus putting you at higher risk for fractures. If you’re going to wear them at all, foot doctors caution, you should not wear flip-flops for long periods of time. Like Jimmy Buffett mourning his blown-out flip-flop in “Margaritaville”, I feel the loss of my brown Reef. The crazy thing is, I cleaned out my closet and suddenly it was gone. Just ONE of them! (Another instance of getting organized and then not being able to find anything. Does this happen to you, too?) Reefs aren’t cheap, plus now these are discontinued. I don’t know how I’m going to replace this thing. There was a time in my life when I would’ve been coveting the latest fall shoes in October. Instead here I am, just wanting a good rubber slipper. Some funny stories we have had with rubber slippers: I always take my shoes off in the car. One time we got to a store and when I looked on the floor, one of my slippers was missing. They’re so light, I must’ve kicked it out at the last stop. So back we drove to the Ross parking lot, circled around a couple of times, and there it was. Mike stopped, and I jumped out and retrieved my rubber slipper. This explains why you see so many orphaned rubber slippers in the road and on the sidewalks in Hawaii. Another time Mike was surfing in Lahaina and left his slippers on the shore as he paddled out. When he came back in, his nice rubber slippers were missing and had been replaced with a pair of “Locals” a very cheap rubber slipper from Longs. To add insult to injury, the end of the slipper had been chopped off with a pair of scissors, like it had been too big for the wearer. Possibly a hand-me-down from an older brother! Mike was not a happy camper. Then we were at a party on Oahu, and the people had a new dog. Out of the whole pile of slippahs left by the door (removed when entering the house, local-style),the dog chose to chew Mike’s rubber slipper, which happened to be new. But what can you do, besides laugh! So, how often do you wear flip-flops? Have you had foot problems related to them? Let us know in the comments section. A hui hou! If you’d like to have this blog delivered to your in-box, please click the Follow button on the Homepage. Mahalo for stopping by! It seems that everyone is paddle-boarding these days in Maui. Mike’s nephew Robert was in Maui this week, visiting from Colorado, and Mike took him to Kanaha Beach in Kahului to teach him to stand-up paddle. The very next day, a stand-up paddle-border was attacked by a shark at Kanaha beach. David Peterson of Pukalani, 55, was uninjured, because he beat the shark off with his paddle. But what’s the reason for the attack? However, kite boarders and windsurfers are not making the same type of sound, because their boards move so quickly through the water. So unless they fall off and are just bobbing in the water, a shark isn’t going to be as interested. David Peterson said he was on top of his board, and when the shark bit it, he fell off and landed on top of the shark. The shark had hold of his board and would not let go of it, so Peterson hit the shark with his paddle as he was in the water. The shark released, but then came between him and the board. With his hands, David pushed the shark away. When he was interviewed on KHON2 news, he said he scrambled to get back on his board while the shark circled, all the while fending him off with his paddle. The shark finally gave up and swam away. While the ocean can be a surfer’s playground, it’s also a feeding ground. So go ahead and enjoy your water sports, but remember: the safest form of surfing these days seems to be the one that involves a paddle that can also be used as a weapon. A hui hou! If you’d like to have this blog delivered to your inbox, please click the follow button on the Home page. Mahalo for stopping by! People can have a somewhat idealized vision of what it means to live in Paradise. My friend Shel and I often discuss the things that people we know back home on the mainland (and for her, Canada) have most recently alluded to: that we spend all our time at the beach, or sipping mai tais, or just relaxing with a good book in a hammock. Oh, how we wish it were so. Right now I have a battle of wits going with a gecko in my office. The battle has been raging for about five weeks, in which time he has pooped on absolutely everything (they hang out on the ceiling and let it fly.) It’s along the window sills, on the floor, on the desk and the bookshelves. At first I tried to ignore it, then the morning came that I walked into the office and there was gecko doo dripping down my computer screen. ENOUGH! I cried. I brought a step ladder into the office, determined to catch him. The ladder has been there for a week now. They are smart and fast and cackle at you. So there Lili and I are in the office. I’m up on the ladder with a broom and she, the goalie, might as well be wearing a mask and holding a little hockey stick, she is so jazzed. Poised and ready down below, she chimes in with her own kitty cackle. The ultimate goal is to whisk the gecko off the ceiling to the floor, and when she nabs him, I will jump down, gently remove him from her mouth, and release him out of doors. But geckos have that annoying survival measure built in, where their tails detatch just as you grab them. 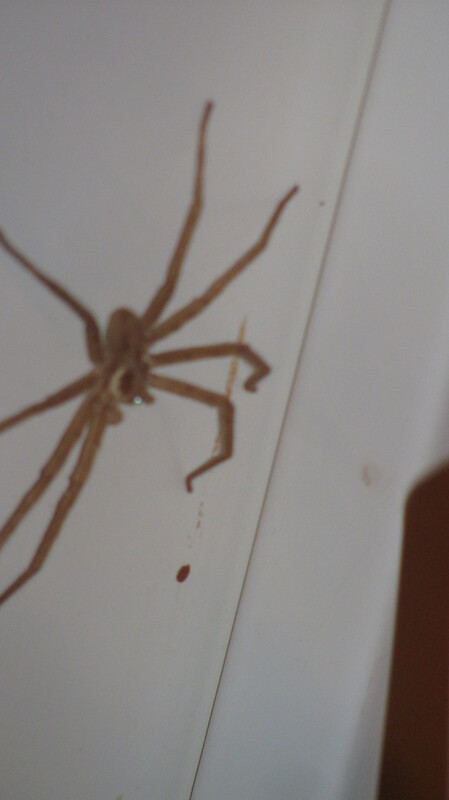 That’s what this one did, then he was off and running across the ceiling. He glanced over his shoulder and cackled at me. Lili felt robbed and said so. Game over. Today I come into the office and get down on my hands and knees. I spot him behind a bookcase, and the chase is on. I am determined not to lose him this time. 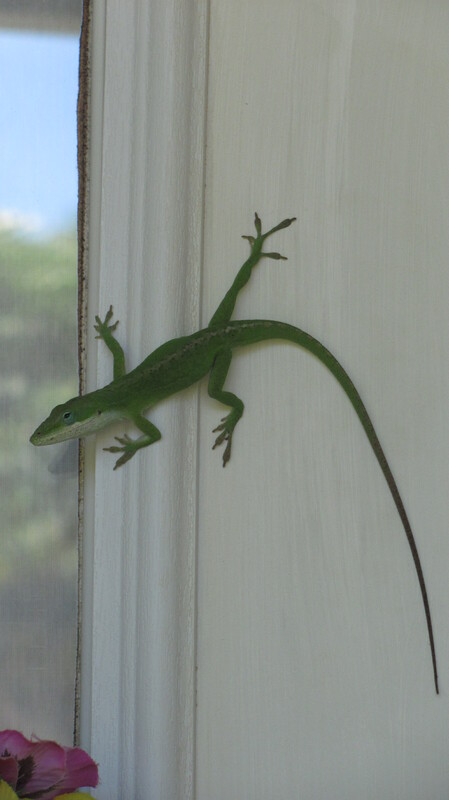 He runs up the wall and high-tails it (no pun intended) up behind the rattan window shade. I take a whack at him with a magazine and he again drops to the floor. Then shoots right up the wall. A dance ensues: I’m up, I’m down on the floor… up, down. He knows my knees can’t take this for long and that he’s winning. He cackles in glee. That’s when I notice: he isn’t missing his tail. There are TWO of them in here, switch-hitting like the twins in “Parent Trap.” I am doomed, people. They can really travel when they put their minds to it, so we again call Lili in to help us hunt. She is quite proud when we are successful as a team, and crushed when we fail. 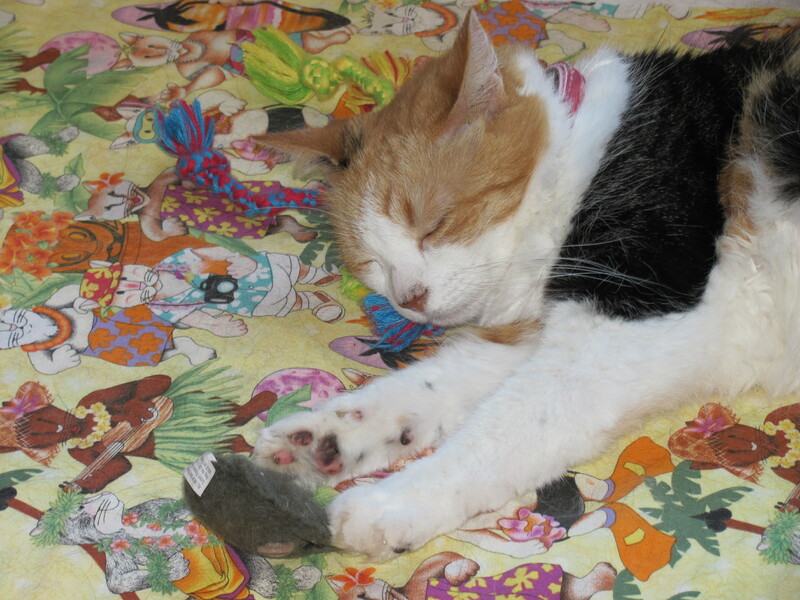 Either way, she gets her daily allotment of tropical fruit, and then takes a nap, making sure to keep her paw on her toy mouse’s tail. Worn out from a day of hunting, we all go to our respective corners to rest up, knowing that tomorrow the Great Gecko Hunt will begin again.